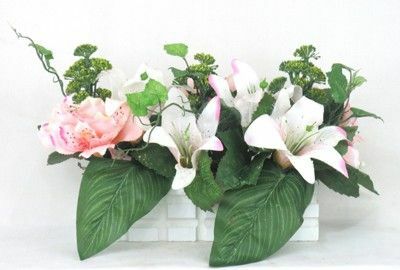 Table Top Arrangement of lilies in wooden base. This flower arrangement looks magnificent. Ready to enhance any decor, it will surely amaze you with its grace and beauty. Crafted in long designer imported wooden vase with silk pink lilies and its green leafs gives it classy look, makes it perfect master pieces for center table. Color : Pink, white Material : Fabric, Wooden Base Product Dimensions (LxBxH) : 6"x4"x6"